For some reason the people at McDonald’s thought it would be a good idea to serve lobster rolls and who better to serve them to than the people who know them best, New Englanders. It was, thank god, only a limited time item, disappearing from the menu mid-August. I thought when it came out I would try it and tell you all about it, but two things happened to save me from such a fate. First, I read an Eater article entitled I Tried the McDonald’s Lobster Roll Because You Shouldn’t. If you haven’t already read this, you should. 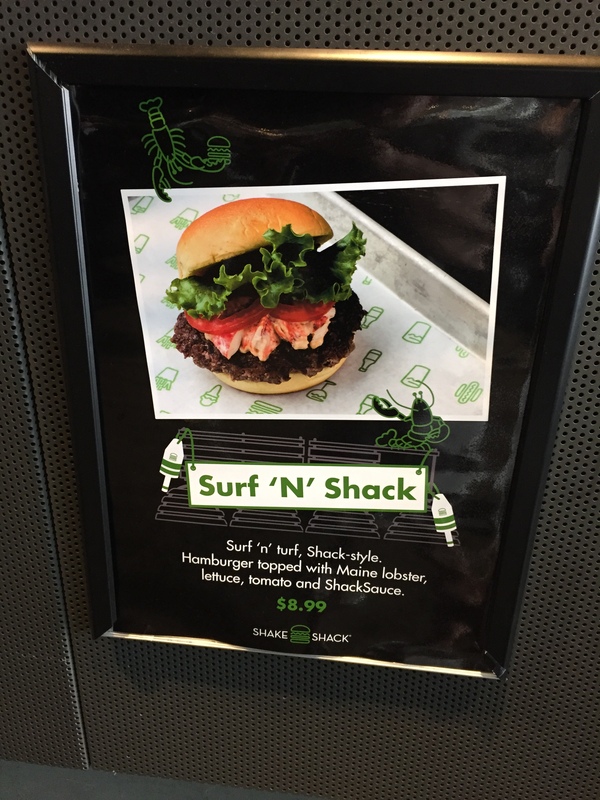 Second, Shake Shack “drummed up” the idea that they would put lobster on a burger. Although this too seemed like a bad idea, it felt far safer than the McDonald’s lobster roll. From August 17 through September 20, Shake Shack is giving you the chance to try this, can we call it creative (no probably not), burger. Given that time is running out, I thought I would let you know all I do about this once in a lifetime opportunity. First, let me say that for the most part I think Shake Shack pretty good. 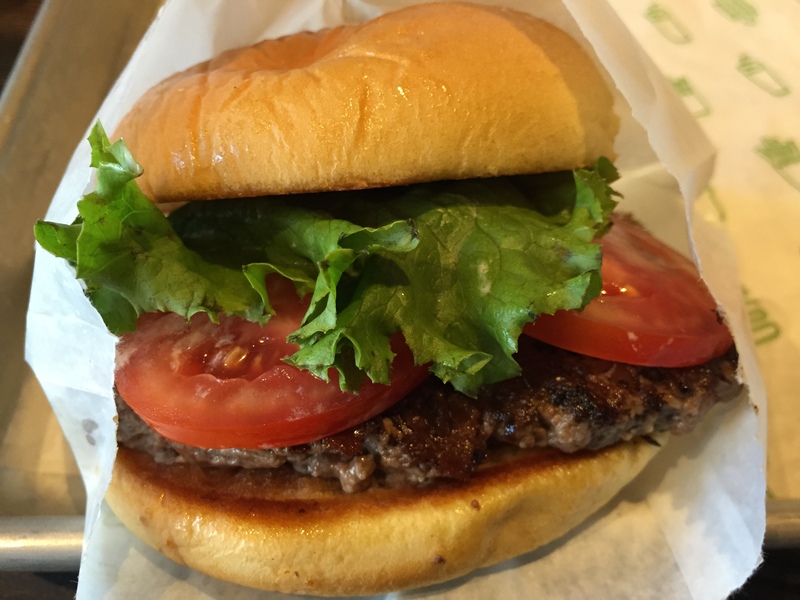 I’m a Tasty Burger guy, but Shake Shack is generally tasty too. 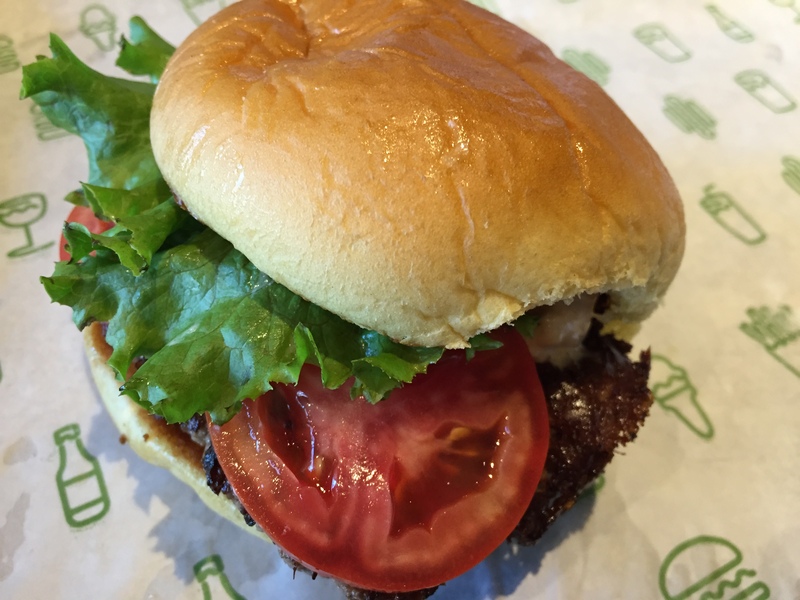 The Surf ‘N’ Shack Burger as told by Shake Shack: “This seaside sandwich consists of a 100% all-natural Angus hamburger topped with Maine lobster, lettuce, tomato, and ShackSauce.” Can I for just a minute complain about the phrase “100% all-natural”? Could it be 30% all-natural or 100% half-natural? What does that even mean? Anyway, how was the burger? The tomato was very good. The lettuce was very good. The burger was good, but too salty. The lobster was average, but for some reason it was mixed with the ShackSauce to create something like a lobster salad. This was more of a small scoop of lobster mush than I was expecting. Perhaps this is because it looked nothing like the picture, as you can see. Where were the big chunks of clean lobster covering the burger? That’s hat I was hoping for but definitely not what I got. My final verdict, don’t get it. I don’t think there is really a reason to put lobster on a burger. 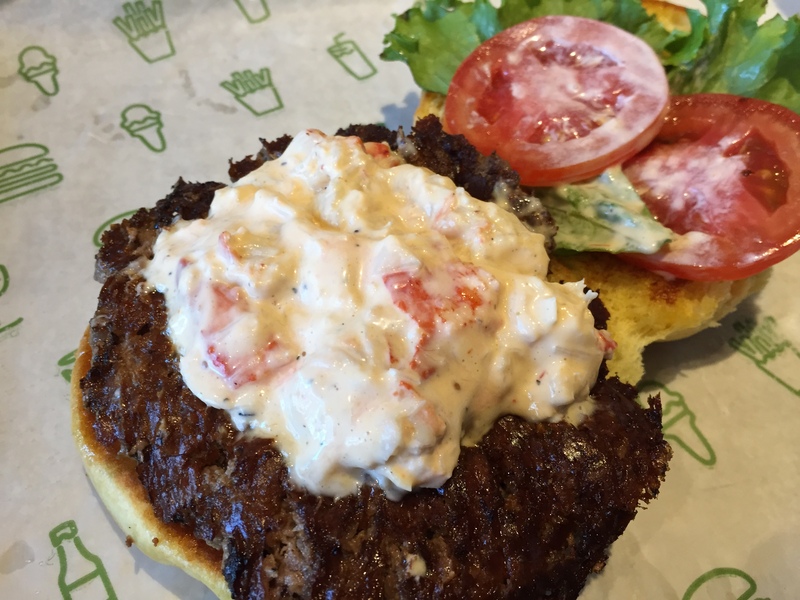 Lobster is good and the Shake Shack burger is good, they just aren’t meant to be together. Maybe if it had been executed perfectly I would have liked it, but it wasn’t. If you want a novelty burger and don’t mind wasting $8.99, be my guest, but I bet you don’t want a second one. There are things in life worth doing once, but if you miss the Surf ‘N’ Shack Burger you shouldn’t feel too bad about it.